Chemise of spotted muslin. Lawn petticoat. Regency fashion 1795. Home » Chemise of spotted muslin. Lawn petticoat. Regency fashion 1795. Morning Dresses April 1795. The Gallery of Fashion Vol. 2. Published by Nikolaus von Heideloff, London. Georgian fashion era. Neoclassical costume in the time of Jane Austen. The hair dressed in ringlets. Chiffonet, arranged into the form of a turban, of white taffeta. spotted with silver; the end trimmed with a silver fringe, falling upon the shoulder. Three white and two scarlet coloured ostrich feathers; and five diamond pins, forming a star, placed in the front. Petticoat of rich striped silk-gauze. Polonaise of scarlet velvet with Circassian sleeves, and full sleeves of striped silk gauze. Small muslin handkerchief within the belt. Gold chain round the neck. Pearl ear-rings. Ermine muff. White shoes. The hair in small ringlets. Turban of coquelicot colored crape. Bandeau set with four rows of pearls, and a large pearl rosette in the middle. One white and one coquelicot and white striped ostrich feather in the front, inclining forwards. Chignon turned up under the turban, and the ends returned over it in three small curls of different lengths. Lawn petticoat, trimmed with a narrow fringe, headed at some distance by a plait. Robe of coquelicot coloured Irish poplin, black velvet cuffs, and capuchin cape, trimmed with a broad white silk chain. The robe fastened by a clasp, set with pearls. Small muslin handkerchief within the robe. Pearl necklace and ear-rings. White shoes. Hair dressed in ringlets. Bandeau and chiffonet of blue and white striped muslin. The Bandeau, crossed with pearls. One blue, and one blue and white striped ostrich feather on the left side. Chemise of spotted muslin with a narrow flounce, and a plaiting round the neck, headed with a blue riband; the sleeves tied in three parts with the same riband. Handkerchief within the chemise. Blue sash. Gold cross, necklace, and ear-rings. White shoes. Ancien Régime, Baroque, Rococo, Revolution, Directoire, Empire, Regency, Restoration, Romanticism, German Biedermeier. The French Republic. Fashion under the French Revolution 1789 to 1804. Directoire, Regency. Comparison of the French and English modes. 1808 to 1815. The Coronation Banquet of Louis XV at Reims 1722. The Gallery of Fashion 1794, by N. v. Heidelhoff. England Georgian, Regency era. Reigns of Louis XVIII. and Charles X. 1815 to 1830. Romantic era, Biedermeier. Fashion in the Reign of Philippe. 1830 to 1848. Romantic era, Biedermeier. early Victorian. The Corset and the Crinolin. A Book of Modes and Costumes. Fashion in Paris and London, 1780 to 1788. The origin of the hooped skirt. 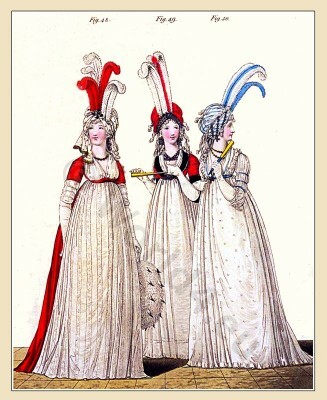 The Evolution of Modern Feminine Fashion 1786. The depravity of Marie Antoinette. Fashion and costume in the eighteenth century. Fashion history by Carl Cohler. Albums of historical hairstyles. Album de coiffures histories par E. Nissy. Les Incroyables et Merveilleuses. Empire fashion by Horace Vernet. The Incroyables and Muscadins. The French directory dandies. French Revolution. Caraco à la francaise in 1786. Heyday of Rococo fashion. Timeline of the French Revolution. Fashion History France. On the history of costumes. Listed chronologically. On the history of costumes. From Ancient to the 19th century. Chronological Gallery. The Ancient Greek Costume. Ancient fashion history. This entry was posted in 1795, 18th Century, England, Gallery of Fashion, Georgian period, Regency period and tagged England Georgian Era Fashion, First Empire Style, Neoclassical dresses, Nikolaus von Heideloff, Regency period on 2/22/13 by world4.